Our dancewear should fit “like a glove.” It may run different than what you may be used to, so please use your regular clothing size as reference. We have had much success guiding in sizing when customers contact us with concerns. Please contact us with any questions. If your dancer prefers her dancewear to fit looser, please size up. 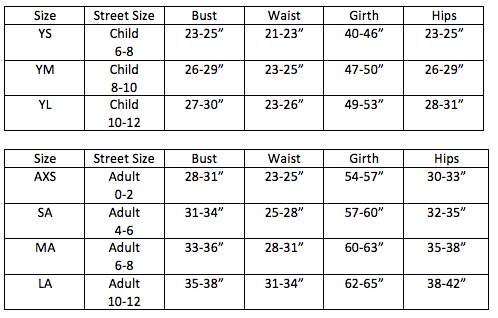 Each leotard does have street size recommendations and Escapade leotards run smaller.